6MHz 3dB bandwidth (10MHz at -40dB) SAW filter for the 2m band. got some question because of the front end filters. How are these specified? Edge frequencies, insertion loss etc. Is it possible to get customer specified filters, if the used filters do not match our application ? Nine filters are lumped LC filters, and two are SAW filters that are designed for 145 and 435MHz. We use SAW filters because the filter profile over relatively small passbands can be more easily fabricated without the need for manual adjustment. The eleven filters together cover the entire frequency range. The design includes careful individual matching of both of the SAW filters and LC filters, together with LNAs and pads to equalise and optimise performance. Just getting the matching right to a given SAW filter can take some time, and without that effort the insertion loss will be many dB out. Just talking about the insertion loss of a filter inside a system without discussing the associated parts around it is probably not of much benefit. Designing and fabricating a SAW filter is an expensive business, and typically it’s necessary to purchase in 1,000s to justify the up-front cost. Is there a synoptic of funcube pro + available ? I would like to have more detailled information about the 9 LC front end filter, and when each is switched ? Is there a filter on 1.2GHz band ? The block diagram that I use in my presentations and is used for certification purposes is here. There is an LC balun bandpass filter for L band made from discrete 0402 parts, but it’s not just for 23cm. Is an ICE RF limiter sufficient to protect the FDP in a nearby transmit environment? The model 196 (0.5-54 Mhz) limits input RF signal threshold at any frequency at 0.3Vrms. The FCD already has protection diodes across at both the antenna and the USB connections. However, they are really designed for ESD protection and not for tons of RF. Certainly the LNA will be saturated! I have sertainly operated several watts very close to the unit without any failure, but I have not gone as far a quantifying any limit I am afraid. What I can state is that I have only been aware of three LNA failures in the original FCD (from several thousand), and the protection is the same. Cartainly two of these were due to rather more than an antenna being connected, and more than 0.3Vrms – the LNA was visibly burnt to a cinder! The other was fixed by its owner at their request after I sent them a replacement part, gratis of course. There seems some discussion regarding the 240 to 420 gap on the FCD+..
As a user who uses the current FCD+ to monitor civil and Military airbands, as well as the sats I guess thats not something that will afect me ..
What is actualy about on the 240 to 420 region for the casual user here in thr UK? Can you explain me why there is a frequency gap and if it can be removed, maybe by using an accessory ? There is a limitation in the local oscillator configuration within one of the devices used on the FCD+. At present I am not aware of an accessory, but then the FCD+ was only released less than a week ago. Can you tell me what it is you’re looking for there? From what I can tell… missing in the Pro + 240 to 420 gap …. Pirates on the satellites ? So a bit more than I thought …. Maybe the Pro + is a compliment to the Pro, not a replacement? I don’t think it is legal to listen to military air frequencies in the UK so that segment missing isn’t a problem. I am sure it is all encrypted now. There are legitimate reasons for wanting to work in that band but if there has to be a gap, this is a good place for it. A simple mixer/converter that could be powered by the bias would restore it. My sample of the new pro+ does appear go down to 406MHz for astronomy and also well above 240MHz. Currently there is not an out of lock indication so it is hard to tell the exact coverage. I will have a go with a signal generator to see. The specification is based on the chip manufacturer’s spec. Although you may well find that the units do extend, this may be subject to temperature as well as each individual unit’s fabrication tolerances. As part of the check out, I run 35 spot frequency tests on every single device. This is mostly to test all the discrete filters are working, but it’s also handy to characterise the devices too. Almost all of them (99%) go down to 410MHz, and about half to 400MHz, but that definitely seems to be temperature/warm-up dependent. Over 99% go up to 260MHz. All so far go to 250MHz. Every one has hit 2.05GHz so far. So although my frequency extremes are perhaps conservative, I would much rather be that way than claim something that’s not consistently achievable. It was just for my curiosity but i’m going to access a BA in Computer Security and there is a project about car remote control security. They have an USRP (+/- 2000€) which is too expensive for me and i search a “low cost” solution. If you want more information we can discuss by mail. I’m afraid I don’t know a lot about the USRP other than in passing interest. If the signals you are looking at are narrow band then the FCD/FCD+ may well be suitable. If it’s a wide band signal (more than about 170kHz or so) then you would need to look at solutions other than the FCD/FCD+. The FCD and FCD+ are receive-only devices that have taken advantage of ASICs that have been developed for multi-standard broadcast reception in consumer devices such as set-top boxes to reduce cost. I’d suggest that USRP and the FCD/FCD+ on the surface are trying to achieve a similar thing, but with different priorities in the engineering mix. The FCD/FCD+ was designed with cost being a primary driver because fundamentally it’s there for educational outreach. Hello. Why isn’t the noise figure measurement methodology published? Why aren’t any dynamic range numbers published? This specification is MUCH more important than nearly pointless SINAD numbers posted. Poor engineering caused the Funcube Dongle Pro to have worse dynamic range and sensitivity than the 10 GBP RTL E4000 DVB-T dongles available on ebay. What’s the purpose of a 16bit ADC on the digital back end if poor engineering only gives 50dB dynamic range on the RF front end? It’s surprising a demo Pro Plus dongle hasn’t been sent to people who publish real useful Funcube specifications like http://www.sm5bsz.com/linuxdsp/hware/funcube/funcube.htm so the non FM repeater ham toy SDR use community will know the real usefulness and performance of the Funcube Pro+. It would be nice to see some real specifications. It seems the specifications posted so far are meant to target the FM repeater rubber duck ham community, which is fine. That’s all most hams are and where the profit is, but it’s a shame to limit the potential of the Funcube like the original Pro version badly did. Once real SDR users measure and post the specification that matter, the rest of the SDR community will know if the Pro+ is worth the asking price. We also need to see frequency stability versus temperature over time numbers. The Funcube Pro suffers from extreme drift http://www.george-smart.co.uk/wiki/FunCube_Dongle_Frequency_Stability but you don’t need to run such a test. Just tune to to a carrier above 1 GHz and hold the dongle in your hand to observe massive drift. Pitty such information isn’t published on funcubedongle.com So far the Funcube has the FM repeater rubber duck ham market cornered, as none of the issues discussed matter to them. Please consider expanding your market base to support the needs of the rest of the community. Thank you. Thank you for your notes. You will find that noise figures are already quoted on the specifications page right here http://www.funcubedongle.com/?page_id=1201 and the method used under the observations notes here http://www.funcubedongle.com/?page_id=1089. I quote SINAD because that was all I had at the time of the original FCD to measure accurately in production. Others had already measured the noise figure independently. I am not sure why you consider it “pointless”. Regarding your other comments, you should consider that the FUNcube Dongle Pro Plus is a completely new design in almost every way. Only the bias T circuitry remains the same. I used the constructive feedback from users of the original FCD to develop the FCD+ in every respect. This includes dynamic range, front end blocking, discrete front end filters, IMD performance and the addition of HF among other enhancements. To suggest poor engineering on the original FCD is a misnomer: the point of having an LNA on the original FCD was precisely because the noise figure of the E4000 used in the original FCD was simply not good enough at VHF by quite some way. The noise figure we measured on 2m directly into the E4000 was about 14dB, it definitely was nowhere near the chip’s specification. I discussed this with the chip manufacturer at some length at the time. Indeed I finally prototyped six different LNAs and chose the best one based on both on-air and quantatative tests for use on 145MHz. This is the band that the original FCD was primarily designed for. As I have to repeatedly remind people, the FCD’s primarily role is for receiving the FUNcube satellite. Everything else is a bonus. You will also see on the board of the original FCD around the LNA space for additional parts to support other LNAs. I did respond to Leif at his own request about this before he published his findings but my response is not discussed in the link you gave. On the subject of the other specifications you mention, I am happy for anyone to measure these if they so wish. When I get chance over the next few weeks I may well do this myself. The truth is that on-air real life tests show the FCD+ to be miles ahead of the original FCD. Regarding frequency stability I have run tests, and that is exactly why although the manufacturer of the TCXO specifies 0.5ppm, I measure about 1.5ppm against a rubidium source. Again, I refer you to the observations page I mentioned. I have also tested to see if the TCXO is digitally or analogue compensated. The manufacturer stated to me that it’s analogue, and my own empirical tests suggest that is correct. Digital compensation would cause stepping during correction so typically analogue compensation is better. I am not sure you’ll find many manufacturers going into such detail that you proposed, and again I am more than happy for others to go ahead and do this for themselves on the FCD+. If I find time I will investigate further. You are welcome to use a $10 dongle if you so wish. There is no way we can ever compete against that, the BOM cost is far more than that price before it’s even been assembled, and there is no donation to our Satellite Building fund. I would suggest that these devices are end-of-life (why do you think they’re so cheap?) so get them while you can. In addition, I find it interesting that I receive emails from people asking me for replacement tuner chips for these $10 devices because the manufacturer didn’t put ESD protection diodes on some of them. Now that’s what I’d call poor engineering! I know I’m replying to an old reply, but I’m going through and reading all replies and posts. Very informative reply Howard, and thank you for all that you’ve done – both for the original FCD and the FCD+. If this blog software allowed me to +1 your reply I’d surely do so. Hopefully by now you aren’t still getting the comparisons between the DVB-T dongles and the FCD+. I bought the FCD because it was (and is) an awesome piece of kit, and I was also helping AMSATUK (I’m here in the states btw). I own two cheap DVB-T dongles and have had fun experimenting with them. I bought and use my FCD+ because I wanted the features, I wanted quality (something lacking with most DVB-T devices… as you mentioned), I wanted to again help out AMSATUK, and because I wanted a superior device for the money. I’m a happy camper. Thank you for your note. Once the design is done, almost all the work is in “mundane” tasks like procurement and vendor management. The interesting stuff, that is designing and building gadgets, often takes second place, especially just after launch when demand outstrips supply. Is the dongle a USB 2.0 or 1.1 device? Thanks for your question. At last an easier question for me to answer! It’s USB 1.1 full speed. Ability to capture a frequency range for later listening/analysis? Ability to create audio from what is directly being received? If it supports capturing a frequency range, ability to create audio from the capture? All your questions refer to a function of your host software, not the dongle itself. If the software supports this, then the answer is yes. The FCD+ uses a standard I/Q sound card interface, software like Spectravue, SDR Radio and SDR Sharp all work. I have briefly tried DRM, using Dream and SDR Radio with VAC, but for some reason it wouldn’t decode the audio although the other two data streams were OK. I suspect that was my software configuration, as the same occurred with other SDRs when I tried them also. The SNR seemed sufficient to decode. I would anticipate we’ll be finding out from other users pretty soon about DRM. Ran into the same thing today. The new versions of Dream do not include the decoder for the AAC-DRM codec anymore due to licensing. For whatever reason the developer did not include a nice message in the GUI, it just sits there and acts as if the signal cannot be decoded. So, either you bulid the decoder dll from source, or you go and use some other DRM software, like SoDiRa (it’s free). You are right, I spent a lonnng time trying to figure this out, I am sure this will help others. Can you tell me what kind of sma ouput this has (male or female)? Thanks. The antenna input is a standard (_not_ RP) SMA socket (female). You will need a standard SMA male connector to mate with it. -What is the current consumption of the FCD pro plus? -Have you considered making a separate antenna input for HF? Is there a tap point for this you can recommend? I would like to avoid lossy combiners. Current consumption is about 160mA, although I report 200mA to the USB stack to allow for a reasonable amount of bias-T current. I don’t use combiners, instead I use FET switches to switch band. At the antenna it’s GaAs SPDT switches spec’d at 0.3dB insertion loss, and in my own measurements that’s about spot on. At 32MHz and above, there is a 5th order high pass filter made using high-Q components before the LNA, then followed by further GaAs SPDT switches. There are eleven GaAs SPDT switches in total on the board. Below 32MHz, there is a passive four bank filter switched using FET muxes. I’m not sure if you’re looking to change the sensitivity for HF or VHF, or both? Putting a separate antenna socket on the unit for different bands would be possible, but difficult logistically to achieve on the board itself. FUNcube Dongle Pro+ broadcast (AM, DRM, WFM) receiving demo. Great video. It looks like you are using DREAM to decode the DRM: I spent some time trying to figure out how to make this work but had no luck. It would decode the data streams but not the audio stream but the SNR seemed sufficient. Is there a trick to this? Hi. If you do not listen audio in last version of the Dream software you must add codec to it ( not easy ) or use previous version of the Dream software which have this codecs attached. No, I meant you now have to use a combiner outside the Pro+ to be able use good HF antenna and a V/UHF antenna for its whole range. I would like to avoid that, making a seperate input for below 32MHz. A frequency dependant antenna switch in software would be another solution. While it’s possible to do, you would need to have some good soldering skills and equipment to do it. And before we start, I can’t warrant this modification, so if things go wrong you are largely on your own! o The band switching matrix is designed such that the HF and non-HF branches carry either the antenna or the calibration signal. To save on GPIOs, and because by design they are mutually exclusive, the ant/calib paths are switched “antiphase” between HF and non-HF. In normal use, the calibration signal is not used, indeed it was only designed for factory calibration, not for end users as it is possible that would break the conformance testing. So you need to isolate the HF signal by removing two capacitors marked. 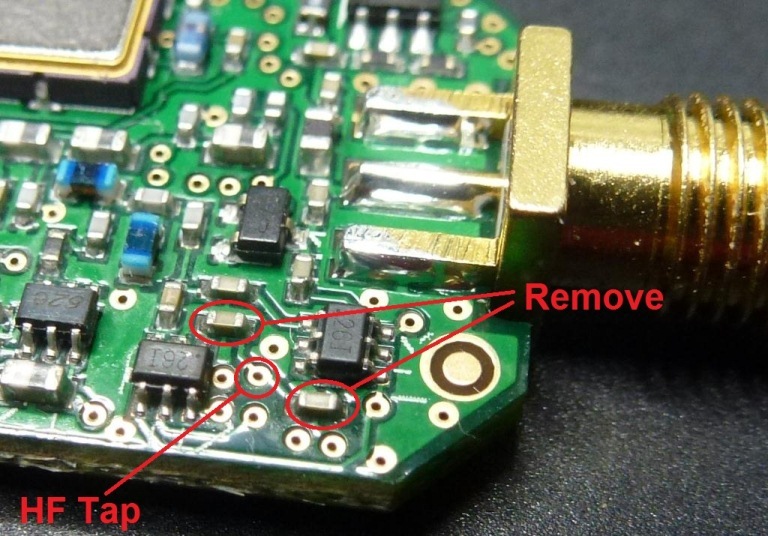 o As the ESD diodes are installed before this in the RF path, you will need to add ESD protection diodes also. o You must AC couple this with a series capacitor. This is essential as the FET switches require a DC bias. Again, please note that this modification is not warranted!!! Like many other enthusiasts throughout the UK and Europe I spend a fair bit of time listening to the UHF airbands between 230 – 400 MHz. Whilst I have enjoyed using my new FCD Pro the addition of the Military Airband would be a great asset in monitoring. Please can you tell me if there are plans to extend the frequency range of the FCD to uncompass this band in the future. I am sure it would be appreciated my many. For the FCD+ there are no plans currently to extend the range. It may be that a third party product may be released in the future. What is all too often forgotten is that the FCD and FCD+ were originally developed to receive the FUNcube Dongle satellite on 145MHz, and everything else is a bonus. Although I understand that you and some other enthusiasts are interested in the military airbands, that was never a requirement in the original design criteria for the FCD or FCD+. I discussed the well-documented gap in the coverage of the FCD+ with many people including retailers and end users before embarking on the final FCD+ designs, and it was not felt that it was worth the additional cost (£40 per unit) of extending the coverage as this was a relatively huge additional cost for something that was not even a design requirement. The addition of LF/MF and particularly HF onthe other hand was felt to be far more popular than military airband coverage would be. A recently overheard conversation relating to the costs of shipping a “classic” 60’s receiver purchased on a popular auction website…. I have to beg to differ. I feel that there would be many people who would be happy to pay the extra £40 for UHF airband coverage, I certainly would. I am sure that you are missing a great oppourtunity, you would be suprised how many people around the world would pay the extra for this extra band. It’s a shame but so be it, I predict that within a year someone will have filled this hole in the market. Thanks for a nice product anyway. I have to beg to differ, recent FUNcube Yahoo polls show that there is not a massive demand for that portion of the band,I feel it would just upset the current production run,saying that I feel a converter is on the horizon by a Yahoo group member. Here in the US there is demand for VHF/UHF all mode MilAir receivers, especially blackbox/SDR with spectrum scope. The only options we have now are discontinued gear found on eBay or current top of the line receivers which require shelling out $400+ USD. If a low cost $200~USD VHF/UHF all mode MilAir SDR receiver is available, as owner of SoCal MilCom, I can and will help get the word out about it to the MilAir community. Coverage of military airband was never a design requirement for the FCD or FCD+, and to add it to the FCD+ would increase the cost by around GBP40/USD60 due to the additional board that would be needed inside the FCD+. As the FCD/FCD+ are price sensitive, and it wasn’t a requirement anyway for the FCD/FCD+, it wasn’t added to the FCD+ although the original FCD’s tuner chip did indeed cover this segment out of the box. Does the frequency cover the USB range, for example 8Mhz? I am not certain the exact question you posing, but it certainly covers the whole of HF including 8MHz. Can you write at which rate the ADC samples, that i can calculate the processing gain? What is the dynamic range at 192 kS/s? I would like to estimate if more than 16 bits at 192 kHz would make sense. Sorry for the delay in responding. I did do some calculations a while ago on this but I can’t find them right now. The ADC is a sigma delta device, with 32-times over-sampling. This means that the analogue filtering is simple. Indeed, as there’s baseband filtering inside the tuner chip too, in the end there’s actually no discrete baseband filtering components required other than the dc blocking caps between the tuner and the codec. There was a trick I had to use in the ADC to make it cut off at Fs/2: in the data sheet, the ADC cuts off at 0.11 * Fs at 192kHz if you use their recommended filters, which is great for audio but not for our purposes. I use a different on-chip decimation filter meant for a different sampling rate, but the down side is that you lose 4 bits of resolution. However as this filtering is done in the digital domain, it just means effectively that the 32 bits/sample/channel sent from the ADC is 28 bits, still far more resolution than is really relevant. Internally in the MCU I shift the bits and truncate the least significant 16 bits. This is simply because at 192kHz for a two-channel USB full speed device is beyond the bandwidth spec and beyond the maximum number of bits (1023) per frame allowed for isochronous streams. If we reduced the sample rate to 96kHz I could quite easily offer 24 or 32 bits as it’s within the USB full speed spec restrictions. Indeed, the code already has this as an option (as well as 48kHz) but it’s disabled because Windows makes a mess of determining the “right” sampling rate. In the end, this is all down to wanting to provide the least amount of set up (ie, no drivers) and configuration before getting up and running. what’s the maximum T-bias current? I’d not risk much more than 40 to 60mA. The total device current is reported to the USB stack as 200mA. The unit itself takes 160mA. Strictly speaking this leaves 40mA, but typically it’ll let you take more. There’s a PTC resettable fuse in there for accidents which trips at 400mA, but I can’t recommend that you take advantage of the fuse in general use as it’s quite possible the USB stack will fold over before the PTC fuse. I would use to compute these signals. The FCD+ provides I and Q signals via a standard audio stereo soundcard interface. If your Python software can deal with stereo soundcard audio streaming input then that should work. Just got my new FCD+ and anxious to use it. Your site makes this statement. Consequently, I assumed it would work on a Mac. However, I can find no instructions on how to set it up for a Mac and it is ignored when I plugged it in to my Mac’s USB port. Further to my comments on running FunCube on my Mac, I do have Windows XP running on my Mac under VMWare Fusion. Under Windows XP, I plugged in the FunCube and I downloaded the SDRSharp software. But after extracting the files, the .exe file will not run. I can not find any statement as to the Windows versions supported — is XP good enough? If it is, can you suggest a solution? I test every unit on both Windows 8 and on Windows XP. It works on XP, Vista, Widnows 7 and Windows 8, both 32 bit and 64 bit. What error messages are you receiving, if any? Are there any symptoms at all when you try to run the .exe? I believe that you need a the appropriate .NET runtime installed for SDRSharp, another one of those wonderfully irritating Microsoft prerequisites. It’s recognised on my Mac right away. What version of OSX are you using? I just checked QTHID 4.1 in conjunction with SDRDX 2.11, that seems to work for me in OSX. You may like to try DSP Radio. Both run natively in OSX. There is not as much software for OSX as there is for Windows, that is true. I frequently run such software on my bootcamp partition under OSX using VMware Fusion. I have followed the development of the FCDPP with interest, including the talk you gave at the 2012 Amsat Colloquium. I am on the current wait list for one of these. Is there software out there that is capable of decoding DAB and DAB+ ? The FCD and FCD+ are designed to receive narrowband signals, and I believe that you need a bandwidth of 1.536MHz to achieve DAB demodulation so it’s not achievable on the FCD/FCD+. “Application failed to initialize properly OxcOOOO135. Click OK to terminate. I went to the Mac. The FCD did not mount on the desktop but it was seen by System Profiler. I then downloaded QTHID and SDRDX and was able to get some stuff to appear on the screen (as you mentioned in your response — never saw this before). But I see there are extensive read-me files. “No drivers required! Device drivers are already included in your operating system – Windows, Linux or Mac OSX, 32 or 64 bit.”which appears to be completely false. Sorry to be difficult. But it looks like I have been somewhat premature in venturing into these gadgets. Firstly I am sorry that you are encountering difficulties in getting your FCD to work. There is no concept of mounting: it’s not a disk drive, it is a USB HID and Audio composite device so the concept of mounting isn’t really relevant. It is true that no additional drivers are required. That was one of the things I learned from the LVB Tracker, that configuring and downloading drivers is one of the most frustrating parts of USB hardware design, so the FCD and FCD+ are designed from the ground up not to require additional drivers that are not part of the operating system itself. I am not sure about the SDRsharp error, can you confirm that you have the required .NET prerequisites installed? Later versions of Windows have them already installed so it’s simply a matter of running the software as per the instructions in the downloadable manual. Again I am sorry that you are encountering difficulties. To be honest the best experience is in Windows with SDRsharp or SDR Radio v2 rather than OSX, but the device does indeed work at the driver level for OSX and Linux by design although it is true that the currently available application experience in those operating systems isn’t always as fully featured as SDRsharp or SDR Radio for example. Does it has mobile frequencies coverage? I notice it is a good alternative to usrp, is it similar to usrp2? It will cover cellular frequencies if that’s what you mean for the non-FCC version: at present, I am only shipping the non-FCC version while we get FCC certification. The FCD+ is an SDR like the USRP but is receive-only. Its span is 192kHz. I don’t have a USRP or USRP2 so I can’t really make a direct user comparison. The technologies used inside are rather different, but if all you’re trying to achieve is to receive narrowband signals then the end result is likely to be similar. I am a beginner so sorry for making silly questions. Can the FUNcube Dongle Pro+ be used as a kind of basic Spectrum Analyzer? I need to build for hobby some antennas that works in this range of frequency: 1080 Mhz – 1280 Mhz ( max Tx power 600mW) and they will used for video/audio transmission. Apart for the building phase of the antenna ( that I will later need to discover how to do), can this product tune on this frequency range ( while the 20$ don’t seem to)? May you explain in simple words to a beginner with a limited knowledge, what are the advantages of your product compared to those cheaper market ones? Sorry for this stupid question but I am really interested in buying FUNcube Dongle Pro+. Yes the FCD+ can tune from about 150kHz up to 1.9GHz, and usually beyond 2.0GHz. There is a gap at most between 240MHz and 420MHz. Be aware that the FCD+ is designed for narrowband modes, but will detect carriers, video or audio. Typically video is a wideband mode, and depending on the modulation and any coding would require at least 6MHz bandwidth to demodulate, sometimes up to 20MHz. If you’re just looking to see if the signal is there then that will work. I am trying to determine the ratio of microvolts entering the FCDPP to normalized [-1,1] values passed to software by the “soundcard” assuming nominal settings (LNA off, 0dB mix gain, etc). Can that be derived from the spec data above? Not sure about -1 to 1, are your referring to full scale (ie, ADC saturation), or the LSBs of the ADC? If it’s the latter, it might be difficult to measure directly due to noise down there. It could be derived from the saturation value. I’ve never measured this specific value myself, the specs are derived as part of a complete system, which is comprised of the FCDPP under Windows XP with Spectravue as the demodulation program. In addition, this will vary significantly between HF and VHF and above: there is an additional external LNA inside the FCDPP used over 32MHz. HF and below wouldn’t benefit from an additional external LNA, as typically the amount of ambient noise for the antenna already exceeds the noise floor without any LNA. Thanks for replying and for pointing out the 30MHz gotcha with the other LNA. The automatic >30MHz LNA is the 30dB boost mentioned in the specs? Regarding normalized values, I am referring to [-1,1] being the full scale of the ADC, with front end LNA off (<30MHz). To put another way: if a 1MHz sine was fed into the FCDPP which was tuned to 1MHz what would the approximate maximum peak voltage of the sine be before the ADC saturated? If this information isn't readily available perhaps I could find an oscilloscope/function generator and perform test sweeps and report back in the distant future? At 1MHz, I measure ADC saturation just above -8dBm with the LNA off. With mixer gain off too, the analogue section saturates before the ADC at about +8dBm, giving about +/-0.5 ADC full scale. This is almost certainly the frontend protection diodes clipping the signal. When doing the test, I also originally picked a sample HF frequency (24.075MHz, it’s one of the spot frequencies I use to check the front end filters) and with LNA switched off, the ADC saturates at just above -5dBm. I had to switch signal generators because my usual comms test set wouldn’t generate enough RF to saturate. This was taken with a single random sample unit, there will be a dB or so variation predominantly due to the tolerance of the front end filter parts. Can this do synchronous detect of a DSB signal? If it needs some level of carrier what is the minimum %? If the host software exists for this, then yes. The FCD+ converts RF to raw zero and ones, it is left for the host software to demodulate. Hope that makes sense! Can it TRANSMIT at the HF shortwave frequency spectrum ? The FCD+ is a receiver. Hi, this dongle can receive vlf signals (24Khz to 50Khz) for processing the signals in gnu radio?? I am working in a vlf receiver to measure the phase of vlf stations. The FCD+ works well down to MF but at LF the receiver increasingly lacks sensitivity. I did some tests some time ago at 60kHz and it wasn’t really useable. Down at 50 and 24kHz, the digital noise inside the FCD+ will probably take over. This is a combination of (a) the tuner chip itself, (b) the front end filtering and (c) the bias T choke. I don’t restrict the setting of frequency, but the performance will not be great. 1- is it really possible to tune on Zero Hz? will this get overridden internally? 2- what is the internal tuning precision? is it exactly 1 Hz? I’m not asking for the tuning accuracy or frequency error in ppm. 3- is the 192 kHz samplerate derive from same clock, used for frequency? when having measured the frequency error in ppm, will this same value be usable for samplerate? No, the PLL VCO will fail and the input is AC coupled anyway. The LF sensitivity of the FCD+ down at the 10s of kHz is low too anyway. It’s not physically disabled though. It depends on what frequency you’re on as the VCO has a programmable divider on the end of it. Internally, the actual steps available are referenced below, however the API only allows for integer frequencies, so a simple truncation is used when calculating the actual frequency to use. Yes, it is. There is only one reference oscillator on the FCDPP. is this the exact formula for used frequency? I just ask to be sure – to use floor() and not round(). Thank you for your detailed answer. It’s not exactly that, I can get you the exact calculation but it’ll take a couple of days: I’m in the middle of moving offices at the moment and unpacking and setting up is taking a bit of time. would be great if you could give exact calculation – after your moving. Somewhat different but same issue: you’ve measured the 26 MHz TCXOs stability to 1.5 ppm. How did you get this value and under what circumstances? Any idea about short term stability (1hour to 1day) after warming up? And last: how are chances to replace the 26 MHz TCXO without damage? The TCXO is a standard clipped sine unit, circa 0.9v p-p. The 1.5ppm was derived empirically from when I test the units prior to shipment. When I quizzed the manufacturer, they stated 2ppm, but please also be aware that due to parts being unexpectedly obsoleted (eg, Murata taking over one of my suppliers), we’re now on the third TCXO, but I now have them made to spec rather than purchasing them off the shelf. I am sure there’ll be a bell curve on distribution, but 1.5ppm seemed to be about right compared to the rubidium reference I used. If you’re OK with SMD rework, replacing the TCXO should only take a minute or so, however please note that the FCDPP has only ever been tested with a 26MHz source. The clock generator chip is only specified between 25 and 27MHz and the functionality of the tuner chip is questionable outside 26MHz: there are device register settings for five spot frequencies between 19.2MHz and 38.4MHz and I don’t know what effect they have. the Excel sheet looks great to use and rather complex to understand. Clear, that this took a while. This will do the job.